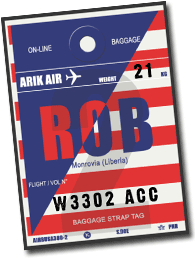 The Liberia Revenue Authority (LRA) has seized a consignment of 2kilograms of heroin brought into the country on an Arik Flight from Nigeria. The bag containing the heroin was sent to Achebe Joseph Uwadioma (AKA, Don Joe), a Nigerian national who operates a business at Waterside and Mechlin Street. The suspicious package was mixed with other foodstuffs to conceal its identity and was being cleared by Mr. Uwadioma’s broker only identified as Lincoln at present. The heroine was detected by an Officer of Customs Anti-Smuggling and Intelligence Section (ASIS) of the LRA. The seizure is an outcome of a rigorous risk based compliance examination being undertaken by the LRA on cargo entering Liberia through RIA. LRA, upon seizing the consignment, turned it over to the Liberia Drugs Enforcement Agency (LDEA) for testing and it was confirmed by LDEA that the consignment was heroine. It was also further confirmed by the Liberia National Police Lab as positive for heroine. The consignment has been turned over to the LDEA for further investigation and disposal. LRA hopes that the investigation will lead to the ring being busted and that the criminals will face the statutory jail time. LRA Commissioner General Elfrieda Stewart Tamba also said that the LRA, in pursuit of its statutory responsibility to collect lawful revenue, will collaborate with all relevant agencies in preventing the flow of illicit drugs through Liberia ports of entry. CG Tamba has meanwhile, thanked the LRA Customs Officer and the other agencies for their swift collaboration. It can be recalled that Customs, sometimes ago, also seized counterfeit Liberian dollars that were smuggled through the Bo Waterside Land Port, concealed in a television.